When a company such as IGT announces a brand new game to the market, everyone goes crazy, as they have some of the best designers, programmers, managers and other key employees in the entire industry. Monty's Millions is one of their most successful titles, released not that long ago. The company main headquarter is located in London, which explains why they have millions of fans only in the UK, and hundreds of millions from all around the globe. The machine is devoted to the movie titled Brewster's Millions, in which the main character - Monty, needs to spend $30 million in 30 days in order to get the remaining $270 million his uncle left him. However, there are some rules he has to follow, which is where it gets interesting. If you are born under the lucky star, maybe you can get to spend millions as well, in any way you like if you hit the main jackpot in this game with edge-cutting graphics and astonishing 3D animations and effects. IGT did the same thing as WMS by going back to the payline system, and not for the ways to win implementation, except that they made those lines adjustable. The amount of active ones can be set anywhere between 1 and 40. 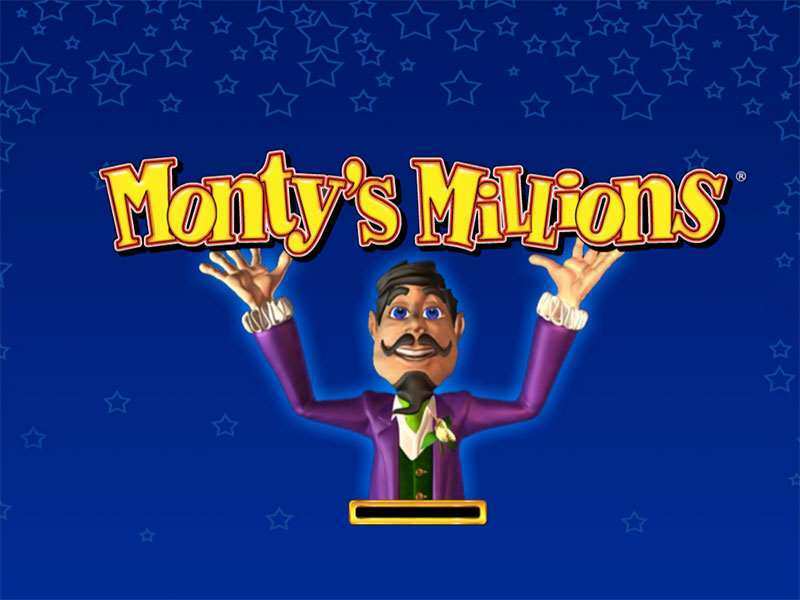 The maximum possible winning prize at the Monty’s Millions slots is £250 million! That is superior to most of the online slots nowadays, making it extremely popular amongst the gaming community. In order to obtain the jackpot, players need to connect five blue wild cards on an active payline while rolling at the maximum bet per line (£10,00 x25.000 = £250 million). Hitting 5 red wilds will apply a x2000 multiplier, while every other prize is x600 or less. Every symbol requires at least 3 matching on a payline in order to activate any sort of prize, with the smallest one being x5. It is a high volatility machine, meaning that it does not award that often, but when it does it rewards the lucky gambler with huge amounts. This is a surprisingly wide betting range, which goes low enough not to disturb the low bettors, and even higher than what most high-rollers are willing to spend for only one spin. Play free Monty’s Millions casino slot machine and enjoy all the perks real money players get, except the real cash gameplay. All of the features, symbols and rewards are available in both modes, without any exceptions. The only difference is that the free version can always be played with no registration and no download, while the real one sometimes requires one of those. However, the entire process of registration and verification is purely made for the player’s safety and has to be done because of the licenses. Real money mode allows players to double up even before spinning by claiming the first deposit bonus, which awards hundreds of pounds and sometimes even triples the investment. Followed by two more starting deposit bonuses, it is the greatest offer you can find online currently. The no deposit bonus is suitable for the beginners, while the high-roller addition manages to satisfy the needs of those who want to deposit larger sums. The percentages for this bonus are usually lower, but the higher limit can go as high as £5.000,00! Even though smile is priceless, winning millions online can sometimes bring a permanent smile to a gambler’s face. That someone could be you if you manage to connect all 5 super wilds in the Monty’s Millions online slot machine! Dazzle Me is a slot machine developed by the NetEnt company which portrays luxury, money and diamonds as well, and it is very similar to this one. The Jackpot is the most valuable feature and games with it included are always going to be superior to those without one. Static always keeps the same value, while the progressive one increases either gradually and automatically or depending on other people investing in the pool, trying to trigger the jackpot! 0 responses to "Monty’s Millions Slot"
1 £250 Million On Top!